Look at something other than your computer screen for a moment and take note of the world around you. You should notice bright highlights and dark shadow areas without much of a problem. Film and digital sensors do not see as well as you do. The shadows and highlights may be quantified as numbers that represent the luminance of any scene. So what does all this mean to me as a photographer? Well, if an average sunny day has a luminance of 100,000:1 this means that the brightest area of a scene is 100,000 times brighter than the darkest area. Of course, all outdoor scenes are not fixed at 100,000:1. Haze, clouds, early morning and late afternoon sun all impact the dynamic range of an image. Shooting at noon is far different than shooting during the golden hours. I generally avoid shooting outdoors between around 10:00 AM and 2:00 PM because even with HDR as a tool, the harshness of the dynamic range does not make for pleasing images. For our purposes here think of stops as exposure values or EV’s. An EV is an integer, a whole number, corresponding to the scene luminance. Under this formula an EV=0 when the correct exposure is 1 second at f/1.0. An EV increment of 1 is the equivalent of 1 stop so that an increase in EV by 1 halves the amount of luminance while an increment of 1 stop down doubles the luminance or available light. The human eye has a dynamic range of 100,000:1 which, in turn, is equivalent to a range of 20EV. Below I show some common mechanical values for a number of capture devices as well as some display medium. So there you have it, the crux of the problem. If the scene outside has a dynamic range of say 50,000:1 and the sensor on your very high quality, professional grade D-SLR only has a sensor capable of capturing a dynamic range of 300:1 how does one capture and display images that have a higher exposure value than the technology is capable of capturing or displaying? Let’s look at how images are captured in your camera as a lead into answering our primary question of how to capture images that are mechanically uncapturable. Digital sensors replace film in the modern world so I will limit this discussion to digital photography. Many D-SLR cameras and some others support a RAW format for image capture. Canon’s CRW and CR2 files or Nikon’s NEF files are examples of proprietary RAW captures. A single RAW file records around 10EV. Pretty good, eh, but still not quite good enough to get everything that’s out there. The advantage of the RAW file, however, is that it captures a continuum of stops from under to over exposed in a single file which can prove advantageous later on. Some users, because of the extended EV have called the RAW file a medium dynamic range image. Cameras also store images as JPEG files. The sensor interpolates the color and intensity and sends the exposure through a series of in-camera steps that address white balance, saturation, sharpness, contrast and so on. JPEG compression, the final step in the process, is performed and the file is stored as a JPEG file. The JPEG file contains only 256 levels of intensity and captures only about 8EV. It is a low dynamic range image. For most studio work the JPEG file is the file of choice for me. It cuts down on my workflow and processing time and for portraiture where I am in full control of the light and the dynamic range of that light, I find no need to shoot RAW. Landscapes, on the other hand, I only shoot in RAW. The two standard formats for saving images after the RAW conversion takes place are TIFF and JPEG. While JPEG files can be produced in-camera from the RAW exposure using proprietary software in the camera, TIFF files are created during processing of RAW files in processing software such as Photoshop or Lightroom. The JPEG file contains luminance values ranging from 0-255 (a total of 256) while the TIFF file stores values from 0-65,535. It is clear that the TIFF file stores a far wider luminance range than does the JPEG file. Still, even the TIFF file cannot capture the full dynamic range of a beautiful landscape. In order to produce a high dynamic range image one must look elsewhere. Two formats for storage are available, the RadianceRGBE (.hdr) and OpenEXR (.exr) generally produced in software outside of Photoshop or Lightroom, I use Photomatix PRO for my HDR conversions from RAW files and generally save the RadianceRGBE format. The RadianceRGBE format is a 32-bit format while the OpenEXR format starts out as 48-bits but is reduced in processing to 32-bits. Both formats are lossless (saving and reopening does not degrade the files). The RadianceRGBE format represents 76 orders of magnitude in dynamic range, remember that the human eye has a mere 20EV range, far more than one might ever need. The drawback, although I have never been able to really see the difference, is that the RadianceRGBE format is slightly less accurate than the OpenEXR format. Once the hdr conversion takes place, that is you now have a.hdr or.exr file there is one more step required. In its native state the hdr files are unusable. One must tone map the hdr file in order to make it useful. Tone mapping is a scaling back process taking the 32-bit hdr file and reducing the 32-bit floating point values present in the HDR file and producing a 16-bit TIFF or 8-bit JPEG file containing fixed integer values. Now you have an image that mirrors the high dynamic range of the landscape you are photographing. While not perfect, the HDR process is a quite good answer to the problem of capturing the uncapturable. Roger Passman is an award winning professional photographer located in Northern Illinois (site currently down). He often leads creative photo workshops designed for beginning through intermediate amateur photographers. One of the top HDR programs is Photomatix (PictureCorrect discount on it here) and one of the top photographers using it is Trey Ratcliff who agreed to give our readers 35% off for 1 more day on his very own photomatix presets! Simply remember to use the discount code PICTUREPHOTOMATIX at checkout. There’s nothing quite like the peaceful, wide-open spaces of the countryside. 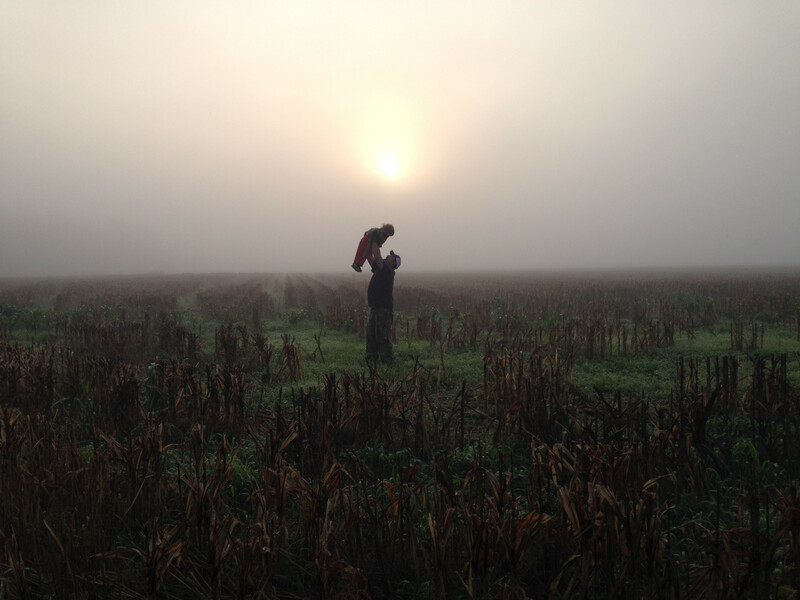 Today’s featured photo shows a father and his young son enjoying their first misty morning after moving to a 3,000-acre farm in northern Arkansas. Enjoying their first day in the countryside (via imgur; click for larger image). I had a moment of clarity. I had a great, great childhood and that farm and those woods and that river had everything to do with it. So I went to the people who owned the house and property now and made them an offer and they accepted. He describes two distinct methods that have the same result – “body rocking” and “safe cracking”, as he calls them. The idea behind both is altering your focus ever so slightly, either through the lens or through your body’s position. This is a very useful technique when shooting large-aperture lenses wide open. With such a shallow depth of field, it becomes almost impossible to get your focus spot on – particularly in the low-light conditions that so often demand the use of these very lenses. Focus bracketing may give you more pictures to sort through, but it can seriously alleviate the pain of missing the focus on an otherwise perfect shot. Frame and focus on your subject. b) Turn your focus knob a little to the right, shoot. Turn it back to the middle, shoot. A little to the left, shoot. Back at your computer, you can view each shot side-by-side and choose which of them has the best focus. Voila! You’ve just tripled your chances of a perfect photo. A certain air of power is present in sports-related advertising. Take in the walls of a Nike store or graze the pages of Sports Illustrated, and visions of strength, perseverance, and success often come to mind. But just how do sports photographers achieve that heroic look? Art and creative directors from advertising agencies choose photographers like Winzeler based on proven portfolios. In the case of Utah’s football shoot, Winzeler was selected because his previous work stood out from the crowd. But the going doesn’t get any easier after being hired or a job. Winzeler worked hard before, during, and after the shoot to wow his clients with images that were beyond what they had expected. He did this by knowing how to make his clients’ visions a reality with extensive planning, expert lighting setups, and the ability to confidently direct his subjects. Working as a commercial sports photographer seems to be just as competitive as being an athlete. The job requires thorough knowledge, skill, and experience. Photographers must be fluent in lighting, camera technique, and the ability to collaborate with other professionals. Clearly, there are no shortcuts to reaching Winzeler’s level of success.